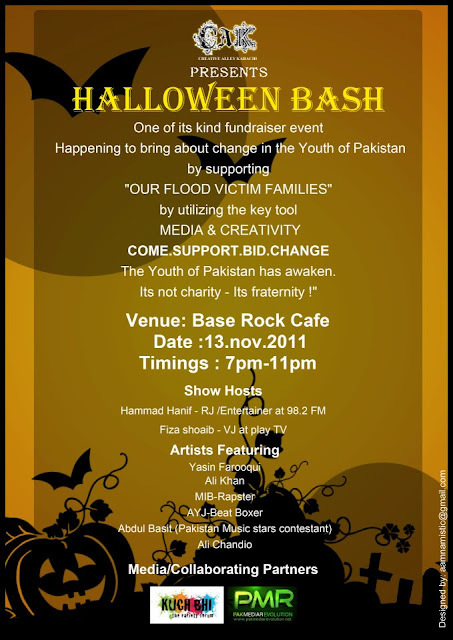 "One of a kind fundraising event , happening to Bring about change in the youth of Pakistan by supporting "OUR FLOOD VICTIM FAMILIES"
,by utilizing the key tool : MEDIA & CREATIVITY . The youth of Pakistan has awaken. Its not charity - Its fraternity !" This fundraiser , isn't just about a simple concert .. its much much more . You can bid for your favorite artists , their gig , lucky charm , free tickets to their concert / back stage passes , dinner with them and lots more !! There will be SURPRISE GUEST appearances as well . Who knows you might be the lucky one to perform or be with them ? Just be there to experience this ultimate event and make a difference. Dress Code : any evil character you fantasied of becoming when u were little. Event Organized by : " Team CAK "
-Eatables bought from outside the cafe are prohibited. -Big Gang of guys are not allowed , mixed group of friends are preferable. -Anyone found with a rowdy behavior with anyone , will be escorted outside the cafe. -No Drinks,Alcohol or drugs allowed !